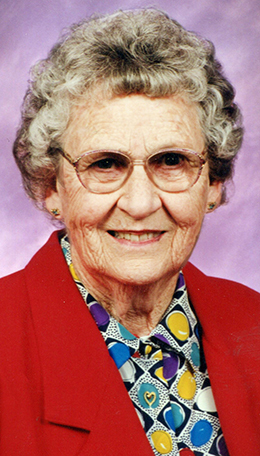 Services are scheduled for 2 p.m. Tuesday, Jan. 8, at First Baptist Church for Alice Jane Collins. Collins, 91, passed away Friday, Jan. 4, 2019, at Good Life Assisted Living. Rick Sullivan will officiate the services, with interment to follow at Woodbine Cemetery. Pallbearers will be her grandsons, Lane Clark, Kyle Collins, Cory Peyton, Doug Collins, Jayd Collins and Brandon Haldeman. Visitation will be held from 1-6 p.m. Monday at Terpening & Son Mortuary. The family will greet visitors from 1-3 p.m.
Alice was born Sept. 1, 1927, in Muleshoe, Texas, the oldest of 11 children of Holbert and Blanche (Wallis) Shirley. The family moved to eastern New Mexico from West Texas when she was a young girl, eventually settling in the Floyd community. Alice graduated from Floyd High School at the young age of 16, as somewhere in their moves, she was advanced directly from third to fifth grade. She graduated as co-salutatorian of her class. On May 17, 1945, she married Fred Collins in Clovis. The couple lived in Ft. Sumner for the first three years of their marriage, operating a service station during the war at a time when the government was rationing gas and tires. After moving to Portales, Fred and Alice were active in several businesses, including a café, a hotel, a lumberyard and construction business, and finally a riding stable on 300 acres behind Oasis State Park. In 1967, they moved the four younger children to a ranch west of Artesia. Margaret, Elton, Billy and Silvia each graduated from the Artesia Public Schools. During their time in school, Alice was very involved in PTAs, FFA programs, athletic events, and whatever else they were participating in. She was very active in the CowBelle organization and served in many capacities. She became interested in family genealogy and travelled all over with some of her siblings to find and visit with lost cousins. Alice was probably best known for the hundreds of quilts she quilted as gifts for her children, grandchildren, friends, and friends of her children! Alice loved each and every one of her family members, and she treated each of them the same. Her many grandchildren, great-grandchildren and great-great-grandchildren were the light of her life! Her face would beam with the biggest and most sincere smile as they would walk or run into those open arms to get that gentle hug and kiss. A quiet and spiritual person by nature, Alice impacted hundreds of people she came in contact with. Even through several years of memory loss, she never lost her spirituality or her sense of humor. Even if she didn’t remember you, she treated you like she had known you forever. And that look she gave Billy Frank every time he teased her was priceless! Her beaming smile shined through it all, even on her final day. Survivors include her children, Rick and Cyndy Collins of Roswell, Wayne and Charolette Collins of Albuquerque, and Margaret and Kenny Peyton, Billy and Glenda Collins, and Silvia and Richard Haldeman, all of Artesia; son-in-law Dave Clark of San Angelo, Texas; 19 grandchildren; 45 great-grandchildren; six great-great-grandchildren; brother Delman Shirley and wife Jolene of Clovis; sisters Wanda Reed and husband Gerald of Clovis, Doris Brown of Austin, Texas, Peggy Sue Gaynor of Chandler, Texas, and Judy Clark of Brownsboro, Texas; sister-in-law Geneva Shirley of Portales; brothers-in-law Gene Collins and wife Lorene of Portales and Charles “Pete” Collins of Washington; sister-in-law Jerry Ramsey of Artesia; and numerous nieces and nephews, and a few remaining cousins. She was preceded in death by her husband, Fred, on June 23, 2011; brothers Albert Shirley and Ronnie Shirley; sisters Arlene Griffith, Marie Kimbrell and Barbara Goddard; daughter Beverly Clark; and son Elton Collins. The family wishes to extend a huge thank-you to Ronda Maxwell for her devoted love and care for the past 10 years for mom and dad both and also the wonderful staff at Good Life for the last 30 days, as well as the loving care from Encompass Hospice the last couple of weeks.